NAUTICOOL AIR is an engine driven marine a/c system that means no need for 110 volt power. A revolutionary new concept in marine a/c. 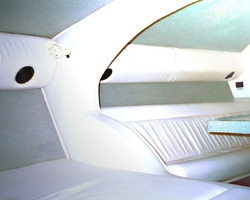 Finally a marine air conditioning system designed by boaters, for boaters, for on the water use without the need for a noisy and bulky generator. Unique, patented design allows installation on most inboard engines. From a smaller run-about to a larger cruiser, NAUTICOOL AIR has a solution for you. What a cool idea for a hot boat. Does your boat have a cabin that you use for thing but storage area because it is just too hot to use in the summer? NAUTICOOL AIR can eliminate that problem. You can use the cabin as it was designed, for people. Have a place to get out of the heat, enjoy lunch, a cool beverage, or have comfortable place to put the kids down for a nap. With the addition of optional units, you can cool different areas; forward, aft cabins, head, and/or helm “dash” vents. We offer combination heating and cooling units as well. Many different configurations are available; NAUTICOOL AIR can be adapted to most inboard or I/O boats.